It’s called “El Ataneo” and it’s a bookstore. As you might be able to tell from the picture, it was built in a space that used to be a theatre back in the 1920s. According to Wikipedia, which never lies, it started as a legit theatre seating 1,050, but was converted to a movie theatre in the 20s. Then someone made it a bookstore. And I want to go there because it looks pretty damn awesome. I don’t even care that I wouldn’t be able to read any of the books I bought there because they’d probably be in Portuguese or Spanish or some other damn language I’m too stupid to learn. Don’t care. I wouldn’t even necessarily buy any books. I’d just soak up the lovely theatre/bookstore aura. And maybe have an espresso in the little cafe that’s housed on what used to be the stage. To learn more, click on this link to an Argentinian travel website. If you’re very nice to me, I’ll take you along for the trip. If I win the lottery, that is. 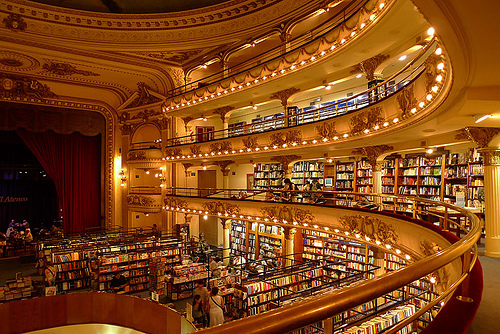 This entry was posted in Cultural and tagged Argentina, books, bookstores, El Ataneo, lottery. Bookmark the permalink. sweet 6 lb. 7 oz. baby jesus! take me with you. PLEASE take me with you! !